The ABFM began in 1985. Since then it has grown to become the largest of its type in Canada and the Pacific Northwest, overflowing the magnificent lawns of Vancouver’s VanDusen Botanical Garden with some 600-plus classic cars and motorcycles, and more than 6,000 enthusiastic visitors. The VRCBC had its usual booth just inside the main entrance. In spite of the damp (genuine British?) 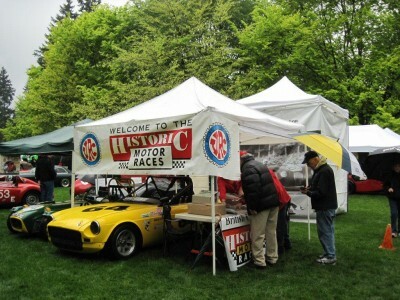 weather, we had many enthusiasts drop by and pick up information on the Club and the BC Historic Motor Races. Club members Al Harvey (MGB), Mark Brown (Lotus Super Seven) and Ralph Zbarsky (MGA Twin Cam) exhibited their vintage British racing cars next to the booth. They had a great time answering questions about their cars.